A Wink’s as good as a nod? OK perhaps the title phrase should be the other way around, but whichever, this is my one and only Swatch Watch. 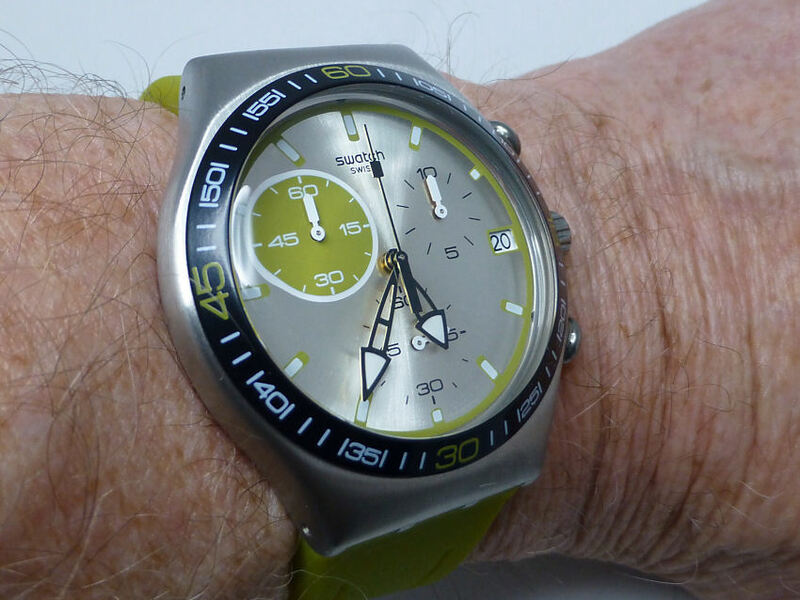 The Swatch Irony Green Wink model chronograph. Now I never really got into the Swatch thing, though recognize it is a real phenomenon and incredibly popular. In fact one of my friends is very in to it, as she loves and collects the Art Deco and high color models that have appeared over the years. Born out of a fight back to the effects of the Quartz evolution, which caught out traditional Watch Making to such an extent their manufacturing base was decimated – in Switzerland from 1600 watchmakers in 1970, to some 600 remaining in 1983. 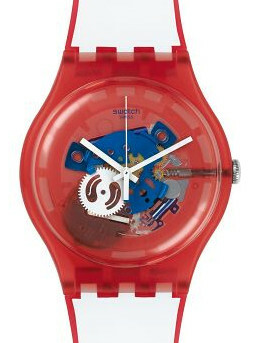 Swatch, the name of which is (apparently) a contraction of “second watch” pulled things together by developing a revolutionary cheap, disposable (second watch concept), plastic cased watch series having only 51 moving parts (usually 91 in mechanical models) and revolutionized the “analog” concept against the new digital. The idea was to try and set a new trend targeted towards the entry level market, which was lost to digital, by producing a plastic trendy model not easily replicated initially by this new competition. And it worked! One of the new concepts was that the watch back was actually utilized as the base plate of the actual movement, resulting in the thinnest watch – the Delirium in 1979. They also used a new automated production system, which drastically reduced costs – the result was very affordable to the user and found amazing popularity. In less than 2 years this resulted in sales of over 2.5 million Swatches were sold. With colored, printed dials with popular political and social trend images to catch the imagination, this made them THE watch to get for the new trendy age. Everyone who was anyone just had to have a Swatch Watch and the Swiss were on the move. The Clownfish in Red shown above is typical, is a semi-skeletal format with different color highlight parts showing in the dial. But at today’s best price of £47.00 whilst it looks OK it’s maybe a little on the high side and for me seems at odds with their “second watch”, throwaway concept – so whilst OK, yeah, yeah I get it, they are not for me. 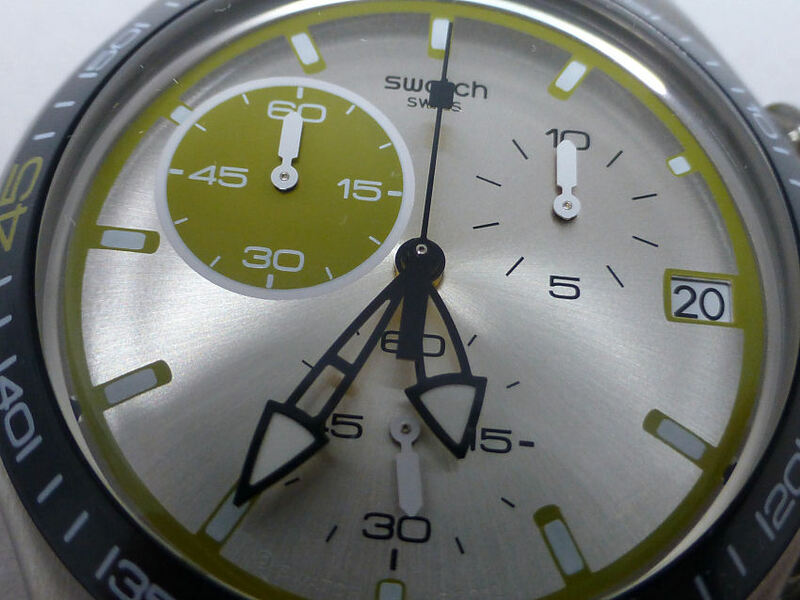 So my first foray into the Swatch world is this year and I’ve at long last got myself the Swatch Irony Green Wink model (image at top of page) – and for three reasons. 3) I luckily found it heavily discounted – so in my book this was, and still is a bargain. (£68.00 and possibly discontinued now but can still be found). Now it’s not the Swatch original plastic case style of previous images, nor the minimal mechanical movement, because the Irony Green Wink is ETA Quartz, and it’s analog, but it’s a Swatch Watch that’s different! In fact very much a Classic style watch, but with the Swatch touch. 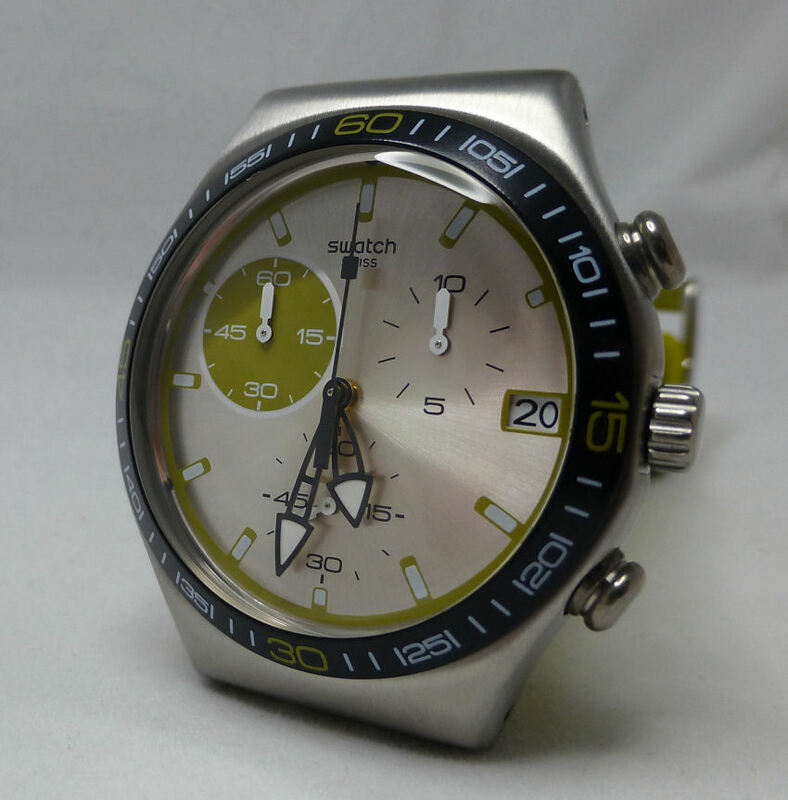 So here we have the Swatch Irony series Green Wink Chronograph Grey watch – YSC565. 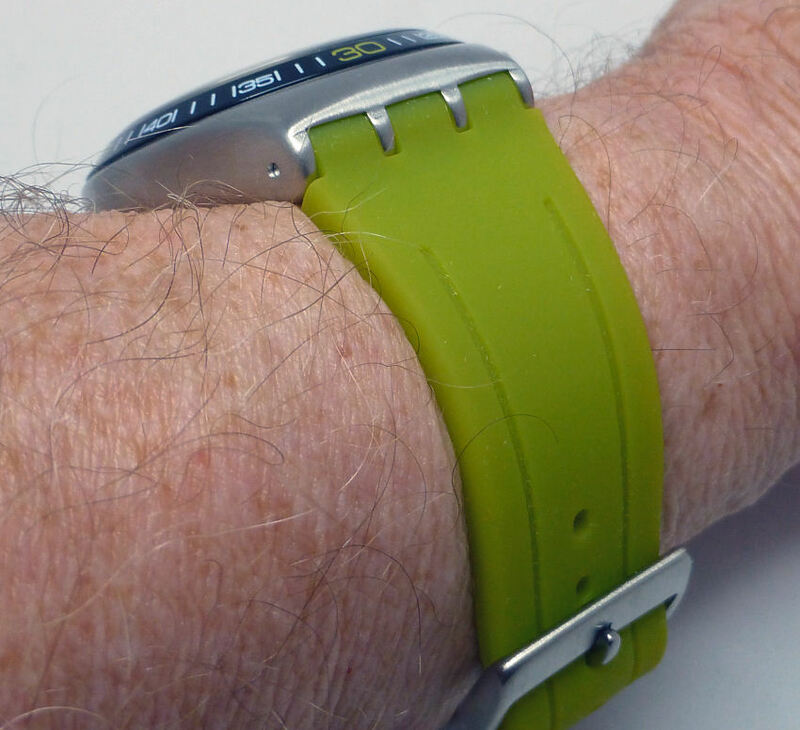 The Green Wink dial design is outstanding and gets noticed. On the wrist – sits well at 40mm x 12.5mm depth. Lug to lug is just 45mm. A deceptively simple but cleverly profiled acrylic crystal to look through and a Swiss quality 4 jewel ETA Quartz movement inside and with battery access coin slot hatch on the back, this is actually a very well made and specified watch in the best Swiss Swatch tradition. Neat battery access hatch within this quality molded steel case. The chronograph buttons I like as they are different, they have rounded tops and dial wise, the features are also different and quirky, from the color to the hand profiles – it looks interesting. 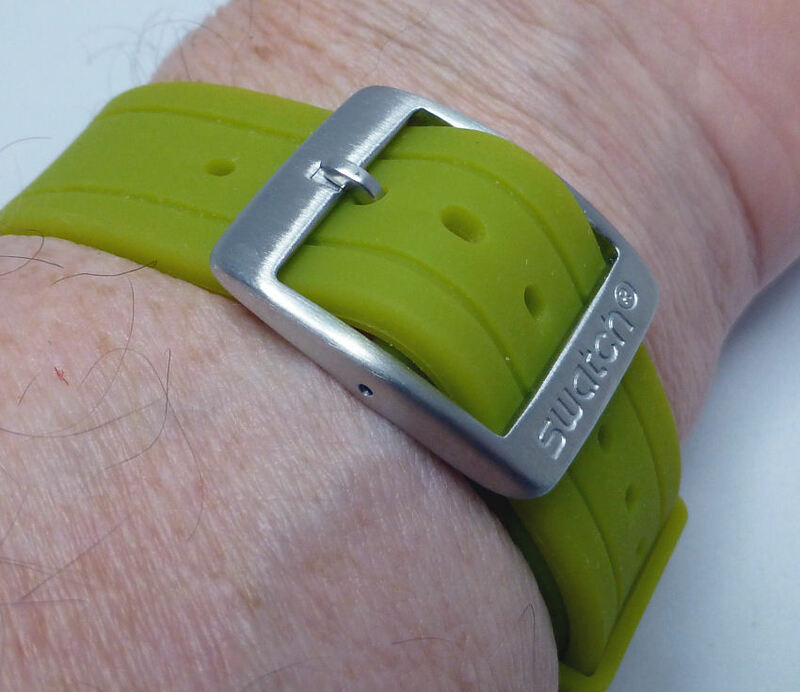 Eye catching strap in very soft and comfortable rubber – gives a neat fit. This particular model is from the 2012 Fall/Winter collection and was designed in 2011. 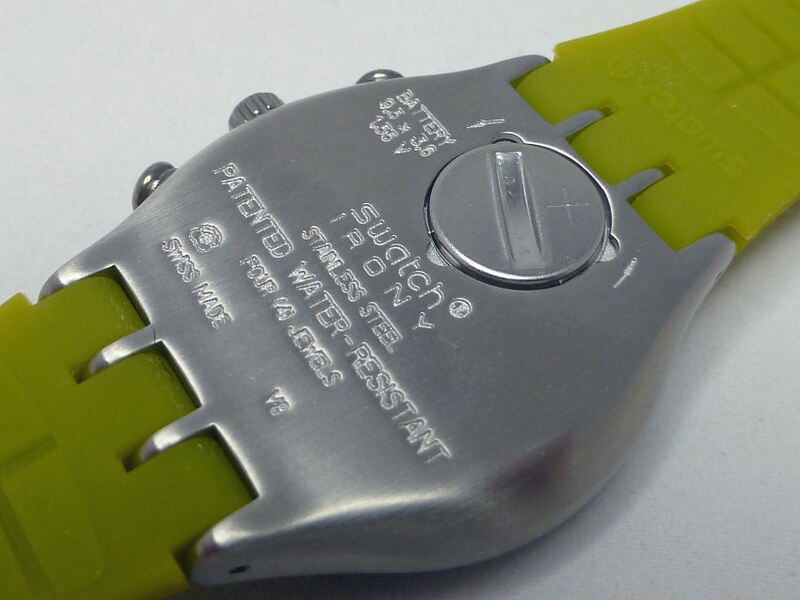 The battery is a 394 series, so easily sourced and the watch comes with a Swatch 2 year Guarantee. 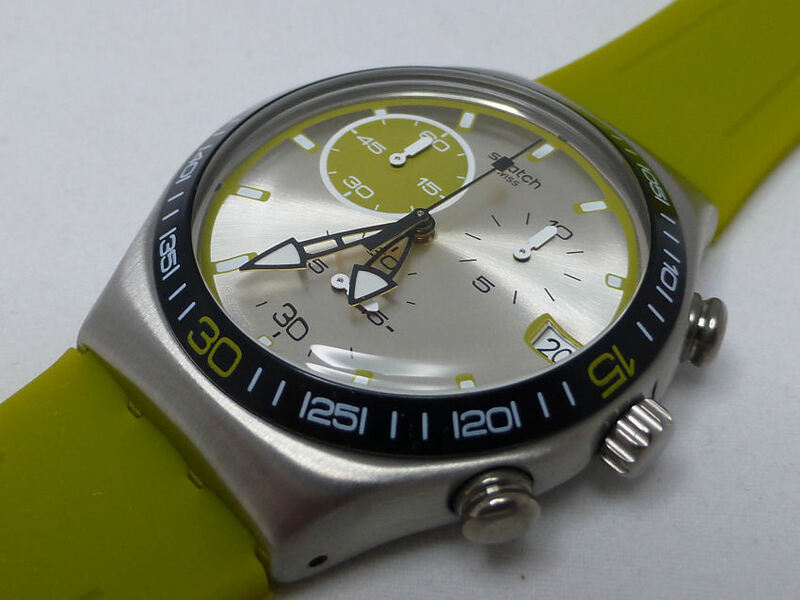 It is also a comfortable watch to wear with that soft rubber compound strap. Note the double buckle arrangement, means you can use it two different ways, either under the metal or over (shown here as under) it is actually more comfortable with the strap over the buckle and using the single keeper only. As to the straps longevity – we’ll just have to see how it goes but first impressions are good, good, good! Note – The dial background is slightly shiny (Internet images show it as almost matt) yet the crystal profile is such that it seems to defy any legibility issues. Whether this is by accident or design I don’t know, but it doesn’t cause a problem at all amazingly. I thought this was going to be my minor criticism, but in the event wasn’t and isn’t at all. So my verdict on this model is – I absolutely love it! Note – Now I have it and wearing it at every opportunity, I’ve looked more carefully at the current Swatch range (as I did last year) and I’m surprised to see quite a few models I like and even the Clownfish is growing on me! Is it possible this Swatch revolution has started, albeit a bit late and I’ve at last got the bug? 😉 Wow!